Sixty-six CSU undergraduate students will have the opportunity to work on research projects with faculty mentors during Summer 2015. Fifty-eight proposals were received from six colleges with requests totaling $450,397. With the generous support of the Provost's office, 36 proposals were funded across six colleges for a total of $249,980. The Fall 2015 Undergraduate Research Poster Session will take place on September 3, 2015 from 10am - 2pm in the Student Center Atrium. Students, faculty, and staff will be invited to attend the poster session, which provides students the opportunity to discuss their research with the CSU community. 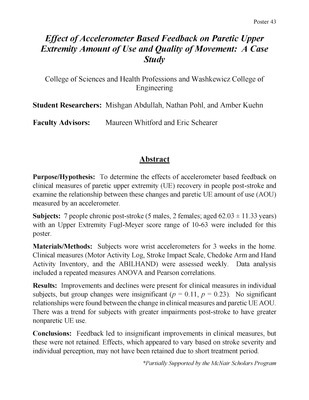 Purpose/Hypothesis: To determine the effects of accelerometer based feedback on clinical measures of paretic upper extremity (UE) recovery in people post-stroke and examine the relationship between these changes and paretic UE amount of use (AOU) measured by an accelerometer. Subjects: 7 people chronic post-stroke (5 males, 2 females; aged 62.03 ± 11.33 years) with an Upper Extremity Fugl-Meyer score range of 10-63 were included for this poster. Materials/Methods: Subjects wore wrist accelerometers for 3 weeks in the home. 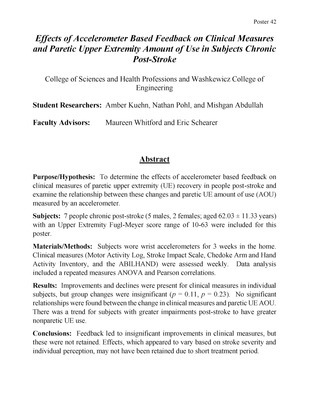 Clinical measures (Motor Activity Log, Stroke Impact Scale, Chedoke Arm and Hand Activity Inventory, and the ABILHAND) were assessed weekly. 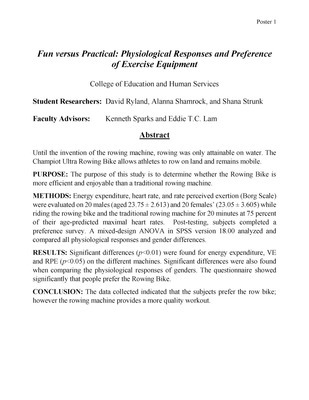 Data analysis included a repeated measures ANOVA and Pearson correlations. Results: Improvements and declines were present for clinical measures in individual subjects, but group changes were insignificant (p = 0.11, p = 0.23). 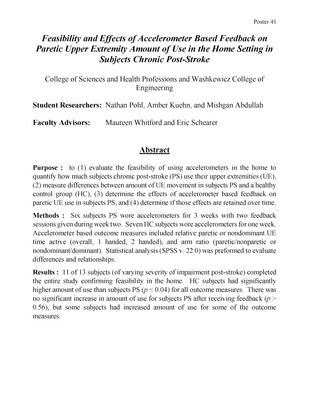 No significant relationships were found between the change in clinical measures and paretic UE AOU. There was a trend for subjects with greater impairments post-stroke to have greater nonparetic UE use. Conclusions: Feedback led to insignificant improvements in clinical measures, but these were not retained. Effects, which appeared to vary based on stroke severity and individual perception, may not have been retained due to short treatment period. Ischemic injury in skeletal muscle caused by hypoxic (low oxygen) conditions occurs in response to vascular and musculoskeletal traumas, diseases and following reconstructive surgeries. 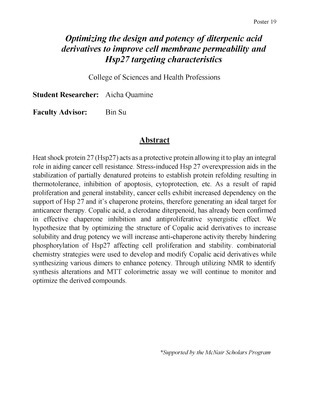 Hypoxia induces apoptotic cell death. We have reported that the protein PUMA plays a critical role in the apoptosis of myoblasts in response to culture in differentiation media as well as exposure to DNA damaging chemotherapeutic agents. 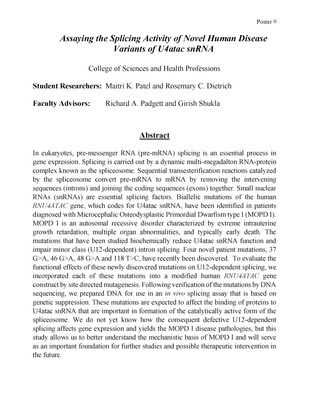 We have also determined that the transcription factor MyoD, known to control the differentiation process, also plays a role in these apoptotic processes by directly increasing the expression of PUMA mRNA. 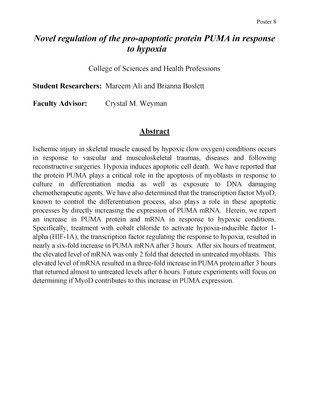 Herein, we report an increase in PUMA protein and mRNA in response to hypoxic conditions. Specifically, treatment with cobalt chloride to activate hypoxia-inducible factor 1-alpha (HIF-1A), the transcription factor regulating the response to hypoxia, resulted in nearly a six-fold increase in PUMA mRNA after 3 hours. After six hours of treatment, the elevated level of mRNA was only 2 fold that detected in untreated myoblasts. This elevated level of mRNA resulted in a three-fold increase in PUMA protein after 3 hours that returned almost to untreated levels after 6 hours. Future experiments will focus on determining if MyoD contributes to this increase in PUMA expression. 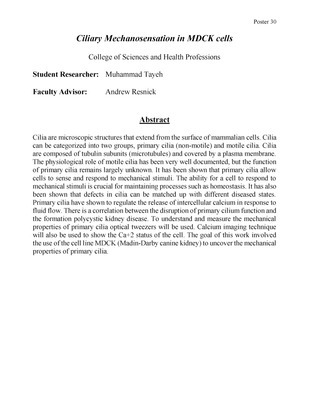 Tubulin-containing structures are important for many important cellular functions, including chromosome segregation during cell division, development and maintenance of cell shape, cell motility, and distribution of molecules on cell membranes. The rapid growth of cancer cells makes them very sensitive to the disruption of tubulin polymerization/depolymerization. Taxol (paclitaxel), a tubulin inhibitor approved by the FDA in 1992 for cancer treatment, is one of the most powerful chemotherapeutic agents. However, the low water solubility and drug resistance limits its clinical application. Various effort in drug discovery field focuses on more water soluble smaller molecular tubulin inhibitors. Our previous study led to the discovery of tubulin inhibitors with IC50s below 1nM to inhibit cancer cell proliferation, and these compounds have much small molecular weight than Taxol. In addition, our compounds showed promising in vivo anti-cancer activity as well. 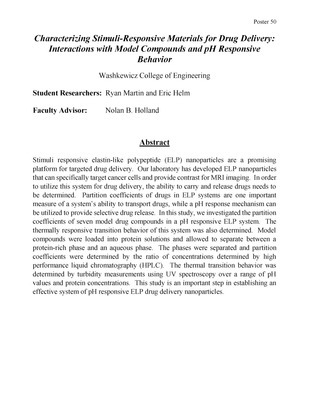 To further improve the druggable characteristics of our drug candidates, we focus on the ligand efficiency of these compounds in the current proposed study. A series of new analogs were designed and synthesized, and their structures were elucidated with NMR spectrum. 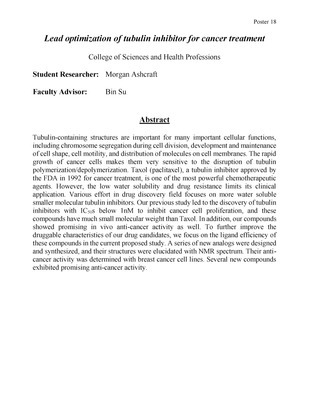 Their anti-cancer activity was determined with breast cancer cell lines. Several new compounds exhibited promising anti-cancer activity. Preliminary Investigation of the Role of Open Bigrams in Word Perception: Is There a Benefit to Having Flankers That Consist of Letters in the Word? 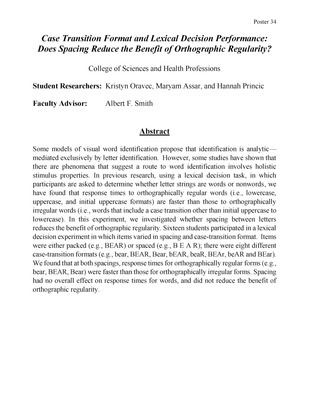 Most investigators of word identification agree that information is processed through a hierarchical system in which units at progressively higher levels respond to features, letters, letter combinations (e.g., pairs, or bigrams), and possibly words. 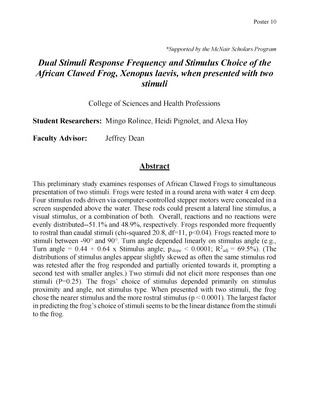 Grainger et al. 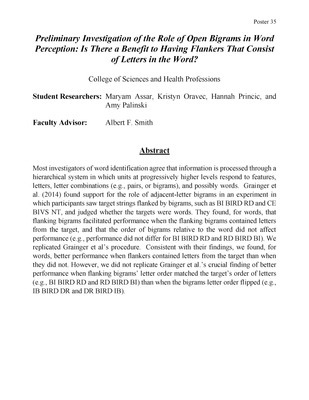 (2014) found support for the role of adjacent-letter bigrams in an experiment in which participants saw target strings flanked by bigrams, such as BI BIRD RD and CE BIVS NT, and judged whether the targets were words. They found, for words, that flanking bigrams facilitated performance when the flanking bigrams contained letters from the target, and that the order of bigrams relative to the word did not affect performance (e.g., performance did not differ for BI BIRD RD and RD BIRD BI). We replicated Grainger et al’s procedure. Consistent with their findings, we found, for words, better performance when flankers contained letters from the target than when they did not. However, we did not replicate Grainger et al.’s crucial finding of better performance when flanking bigrams’ letter order matched the target’s order of letters (e.g., BI BIRD RD and RD BIRD BI) than when the bigrams letter order flipped (e.g., IB BIRD DR and DR BIRD IB). The computing power of current Graphical Processing Units (GPUs) has increased rapidly over the years. They offer much more computational power than recent CPUs by providing a vast number of simple, data parallel, multithreaded cores. 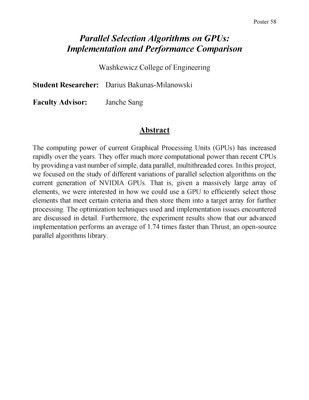 In this project, we focused on the study of different variations of parallel selection algorithms on the current generation of NVIDIA GPUs. That is, given a massively large array of elements, we were interested in how we could use a GPU to efficiently select those elements that meet certain criteria and then store them into a target array for further processing. The optimization techniques used and implementation issues encountered are discussed in detail. Furthermore, the experiment results show that our advanced implementation performs an average of 1.74 times faster than Thrust, an open-source parallel algorithms library. 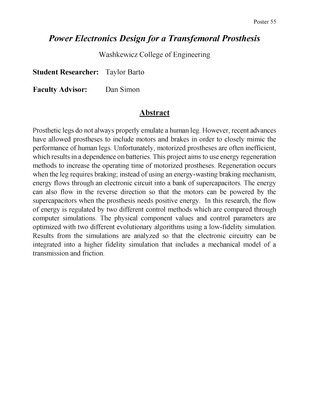 Prosthetic legs do not always properly emulate a human leg. However, recent advances have allowed prostheses to include motors and brakes in order to closely mimic the performance of human legs. Unfortunately, motorized prostheses are often inefficient, which results in a dependence on batteries. This project aims to use energy regeneration methods to increase the operating time of motorized prostheses. 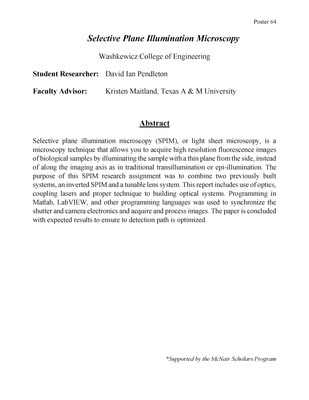 Regeneration occurs when the leg requires braking; instead of using an energy-wasting braking mechanism, energy flows through an electronic circuit into a bank of supercapacitors. The energy can also flow in the reverse direction so that the motors can be powered by the supercapacitors when the prosthesis needs positive energy. 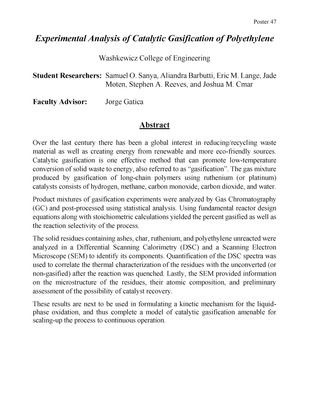 In this research, the flow of energy is regulated by two different control methods which are compared through computer simulations. 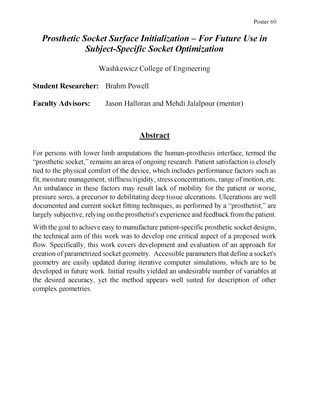 The physical component values and control parameters are optimized with two different evolutionary algorithms using a low-fidelity simulation. 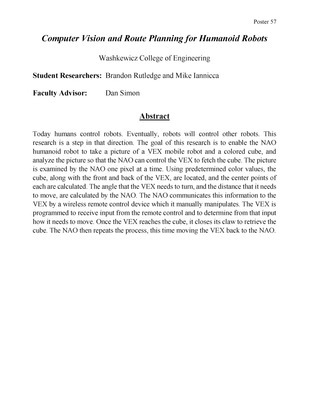 Results from the simulations are analyzed so that the electronic circuitry can be integrated into a higher fidelity simulation that includes a mechanical model of a transmission and friction. The present study focuses on the language speakers whose first language has been degraded by continuous exposure to a new, dominant language. The specific goal is to ascertain the cultural elements of the Cleveland Hungarian community and how this culture impacts language ability of the heritage Hungarian speakers. We reveal language preservation processes and the effect of living in a country with a different dominant language, in this case English, on the minority heritage language. 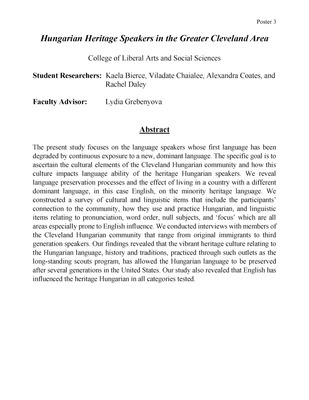 We constructed a survey of cultural and linguistic items that include the participants’ connection to the community, how they use and practice Hungarian, and linguistic items relating to pronunciation, word order, null subjects, and ‘focus’ which are all areas especially prone to English influence. We conducted interviews with members of the Cleveland Hungarian community that range from original immigrants to third generation speakers. Our findings revealed that the vibrant heritage culture relating to the Hungarian language, history and traditions, practiced through such outlets as the long-standing scouts program, has allowed the Hungarian language to be preserved after several generations in the United States. Our study also revealed that English has influenced the heritage Hungarian in all categories tested. Falling is a major health concern for older adults. 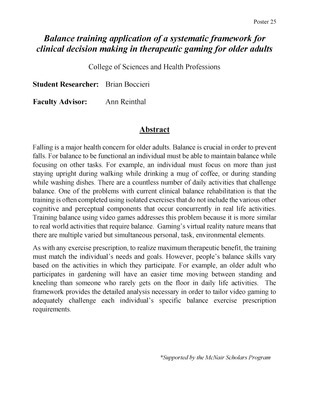 Balance is crucial in order to prevent falls. For balance to be functional an individual must be able to maintain balance while focusing on other tasks. For example, an individual must focus on more than just staying upright during walking while drinking a mug of coffee, or during standing while washing dishes. There are a countless number of daily activities that challenge balance. One of the problems with current clinical balance rehabilitation is that the training is often completed using isolated exercises that do not include the various other cognitive and perceptual components that occur concurrently in real life activities. Training balance using video games addresses this problem because it is more similar to real world activities that require balance. Gaming’s virtual reality nature means that there are multiple varied but simultaneous personal, task, environmental elements. As with any exercise prescription, to realize maximum therapeutic benefit, the training must match the individual’s needs and goals. However, people’s balance skills vary based on the activities in which they participate. For example, an older adult who participates in gardening will have an easier time moving between standing and kneeling than someone who rarely gets on the floor in daily life activities. 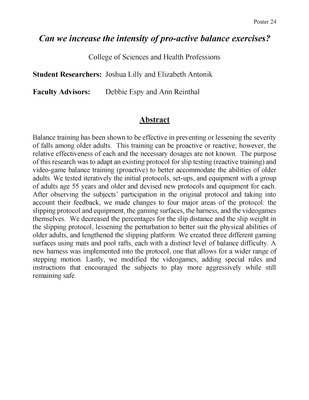 The framework provides the detailed analysis necessary in order to tailor video gaming to adequately challenge each individual’s specific balance exercise prescription requirements. 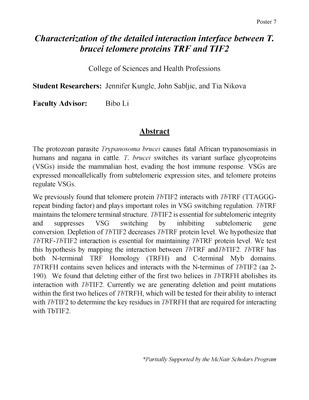 In order to obtain a tangible basis for vaccine targets, it is crucial to understand the role of proteins at the site of invasion. In previous study, 27 novel rhoptry proteins were identified by MudPIT analysis and immunoelectron microscopy. 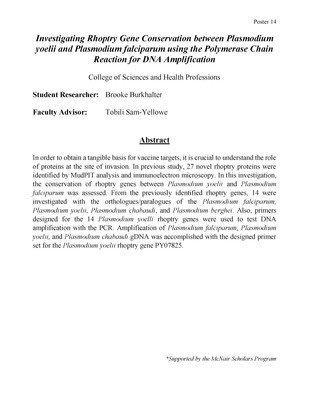 In this investigation, the conservation of rhoptry genes between Plasmodium yoelii and Plasmodium falciparum was assessed. From the previously identified rhoptry genes, 14 were investigated with the orthologues/paralogues of the Plasmodium falciparum, Plasmodium yoelii, Plasmodium chabaudi, and Plasmodium berghei. 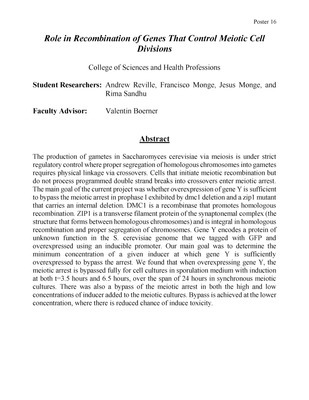 Also, primers designed for the 14 Plasmodium yoelli rhoptry genes were used to test DNA amplification with the PCR. 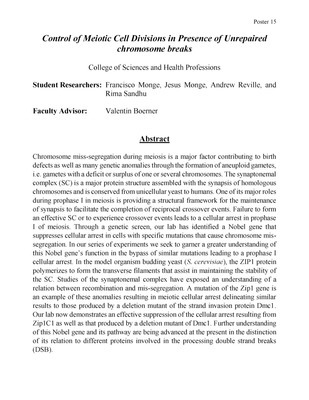 Amplification of Plasmodium falciparum, Plasmodium yoelii, and Plasmodium chabaudi gDNA was accomplished with the designed primer set for the Plasmodium yoelii rhoptry gene PY07825. Stormwater management features such as bioretention systems and rain gardens provide valuable ecosystem services. They are ecologically engineered to counteract surrounding urban land use practices. However, new stormwater management features may also create an environment for invasive plant species. Invasive plants can affect ecosystem services, and have devastating economic impacts. 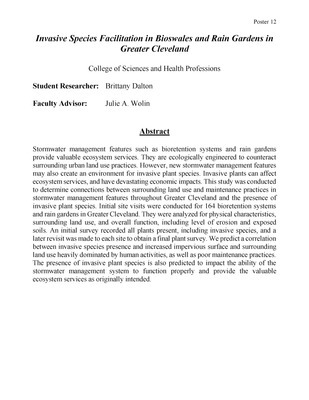 This study was conducted to determine connections between surrounding land use and maintenance practices in stormwater management features throughout Greater Cleveland and the presence of invasive plant species. Initial site visits were conducted for 164 bioretention systems and rain gardens in Greater Cleveland. They were analyzed for physical characteristics, surrounding land use, and overall function, including level of erosion and exposed soils. An initial survey recorded all plants present, including invasive species, and a later revisit was made to each site to obtain a final plant survey. We predict a correlation between invasive species presence and increased impervious surface and surrounding land use heavily dominated by human activities, as well as poor maintenance practices. The presence of invasive plant species is also predicted to impact the ability of the stormwater management system to function properly and provide the valuable ecosystem services as originally intended. An extraction procedure and gas chromatography mass spectrometry (GC-MS) method was developed for quantitation of plasma amino acids. 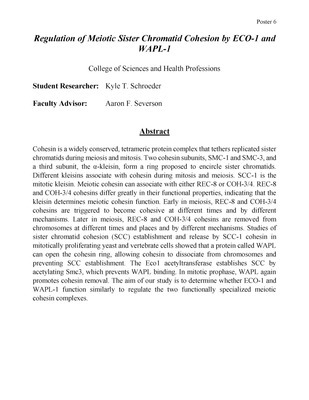 The experimental workflow included extraction of amino acids from plasma, followed by derivatization protocol for GC-MS compatibility. Automated Mass spectral Deconvolution and Identification System (AMDIS) and laboratory developed library was used for compound identification. 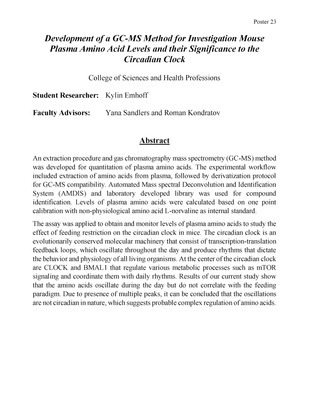 Levels of plasma amino acids were calculated based on one point calibration with non-physiological amino acid L-norvaline as internal standard. The assay was applied to obtain and monitor levels of plasma amino acids to study the effect of feeding restriction on the circadian clock in mice. The circadian clock is an evolutionarily conserved molecular machinery that consist of transcription-translation feedback loops, which oscillate throughout the day and produce rhythms that dictate the behavior and physiology of all living organisms. At the center of the circadian clock are CLOCK and BMAL1 that regulate various metabolic processes such as mTOR signaling and coordinate them with daily rhythms. Results of our current study show that the amino acids oscillate during the day but do not correlate with the feeding paradigm. Due to presence of multiple peaks, it can be concluded that the oscillations are not circadian in nature, which suggests probable complex regulation of amino acids. Previous research reports that with compliance, safe movement programs and policies play a large roll in reducing worker injury and safe patient handling. The purpose for our research is to better understand the daily safe movement practices of State Tested Nursing Assistants as it relates to the safe handling and transferring of patients. We used Qualtric software to electronically survey 14 STNAs from Jenning’s Center for Older Adults Upper Level Neighborhood. The survey consisted of 7 forced choice questions and 19 open ended or follow up questions. The scope of our research covers the complexities of the daily tasks of STNAs and the injuries acquired during patient transfers. It also addresses education, implementation, and barriers of safe movement police and practices, job satisfaction and overall happiness, as well as mental and physical healthy behavior practices. The results of our research show that the profession of STNA is very physically and mentally demanding. Our research confirmed results reported in the literature that the most common work related injuries acquired by STNAs were to the lower back. Results show that half of the participants report they never or almost never physically exercise. Over half of the participants reported that in performing their job duties they were unable to comply with OSHA and BWC recommendations to avoid independently lifting more than 50 pounds. Although many opportunities were given for additional comments, most STNAs were reluctant to provide more information. Over 75% of the participants report being very happy with their job role as an STNA. Stormwater runoff is a major problem in many residential municipalities. Rain water washes pollutants and chemicals off of streets, driveways and lawns. Stormwater management practices help filter out harmful particles before they enter into our water ways. The goal of this project was to assess green infrastructure stormwater practices throughout Cuyahoga County. We assessed 165 sites in over 10 cities in Cuyahoga County. We examined bioswales, bioretention basins, and rain gardens. Sites were visited in late May through early June and revisited in mid-July to early August. We compared spring condition of plants and gardens and recorded resident’s perceptions whether positive or negative. We found residents are often unfamiliar with the purpose of rain gardens and bioswales, and why certain plants were planted. Improper care and maintenance results in loss of beneficial plants and provides an avenue for invasive species. Aesthetics are also issue for some residents who view them as weedy and unkempt. 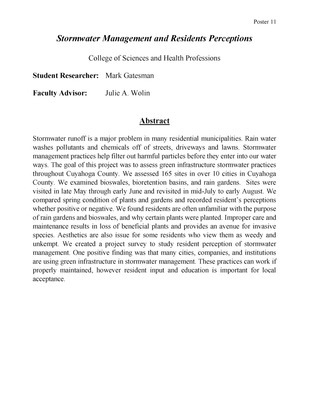 We created a project survey to study resident perception of stormwater management. One positive finding was that many cities, companies, and institutions are using green infrastructure in stormwater management. These practices can work if properly maintained, however resident input and education is important for local acceptance. Depression is characterized by a reduced capacity to experience pleasure (hedonic capacity). A growing literature suggests that hedonic capacity is supported by the sympathetic (SNS) and parasympathetic (PNS) branches of the autonomic nervous system. Both branches may work in a reciprocal fashion, or in tandem, reflecting co-activation of the SNS and PNS. While reduced PNS and increased SNS activity are associated with happy states among healthy individuals, preliminary findings suggest that depressed persons evidence blunted physiologic responses across a variety of emotion inducing stimuli. 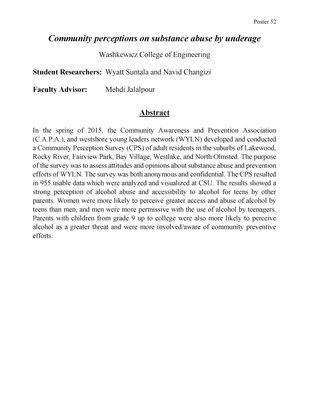 Much of this work, however, has examined PNS and SNS activity separately, and never with respect to hedonic stimuli. We examined whether depression symptoms and low hedonic capacity are associated with jointly blunted autonomic activity across the two branches. Twenty-nine participants completed measures of depression, state hedonic capacity, and trait hedonic capacity. Physiologic baseline and reactivity to a happy film clip were also collected. 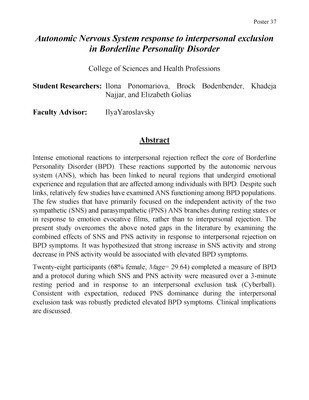 SNS and PNS co-activation during baseline significantly predicted reduced state and trait hedonic capacity. 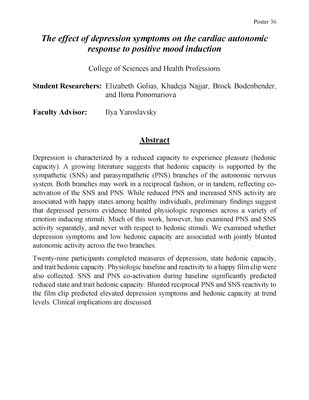 Blunted reciprocal PNS and SNS reactivity to the film clip predicted elevated depression symptoms and hedonic capacity at trend levels. Clinical implications are discussed. 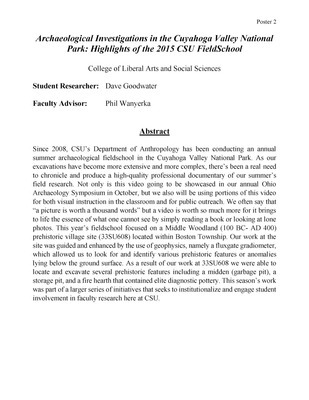 Since 2008, CSU’s Department of Anthropology has been conducting an annual summer archaeological fieldschool in the Cuyahoga Valley National Park. As our excavations have become more extensive and more complex, there’s been a real need to chronicle and produce a high-quality professional documentary of our summer’s field research. Not only is this video going to be showcased in our annual Ohio Archaeology Symposium in October, but we also will be using portions of this video for both visual instruction in the classroom and for public outreach. We often say that “a picture is worth a thousand words” but a video is worth so much more for it brings to life the essence of what one cannot see by simply reading a book or looking at lone photos. This year’s fieldschool focused on a Middle Woodland (100 BC- AD 400) prehistoric village site (33SU608) located within Boston Township. Our work at the site was guided and enhanced by the use of geophysics, namely a fluxgate gradiometer, which allowed us to look for and identify various prehistoric features or anomalies lying below the ground surface. As a result of our work at 33SU608 we were able to locate and excavate several prehistoric features including a midden (garbage pit), a storage pit, and a fire hearth that contained elite diagnostic pottery. 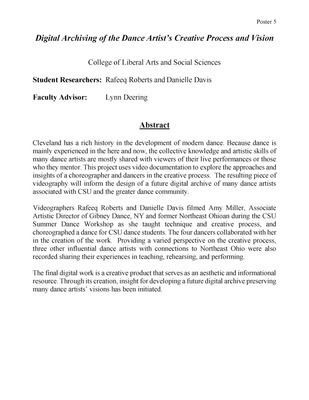 This season’s work was part of a larger series of initiatives that seeks to institutionalize and engage student involvement in faculty research here at CSU. Computer-vision based human motion tracking has undergone intensive research for the past several decades. As exemplified by Microsoft Kinect, inexpensive portable computer-vision based motion sensors can now be used to accurately track human motions in many application domains, particularly in the healthcare area, such as rehabilitation exercises, fall detection, and safe patient handling. However, such computer-vision based technology is rarely used in venues such as hospitals and nursing homes, primarily due to privacy concerns. 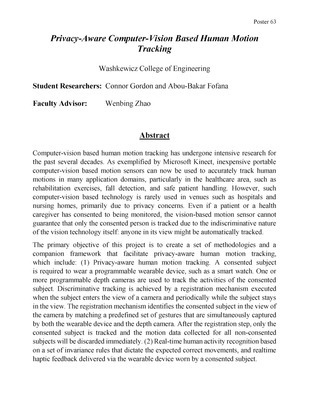 Even if a patient or a health caregiver has consented to being monitored, the vision-based motion sensor cannot guarantee that only the consented person is tracked due to the indiscriminative nature of the vision technology itself: anyone in its view might be automatically tracked. The primary objective of this project is to create a set of methodologies and a companion framework that facilitate privacy-aware human motion tracking, which include: (1) Privacy-aware human motion tracking. A consented subject is required to wear a programmable wearable device, such as a smart watch. One or more programmable depth cameras are used to track the activities of the consented subject. Discriminative tracking is achieved by a registration mechanism executed when the subject enters the view of a camera and periodically while the subject stays in the view. The registration mechanism identifies the consented subject in the view of the camera by matching a predefined set of gestures that are simultaneously captured by both the wearable device and the depth camera. After the registration step, only the consented subject is tracked and the motion data collected for all non-consented subjects will be discarded immediately. (2) Real-time human activity recognition based on a set of invariance rules that dictate the expected correct movements, and realtime haptic feedback delivered via the wearable device worn by a consented subject. Most driving simulation experiments begin with a practice scenario, to allow participants to learn how to interact with the driving simulator. During practice, driving performance improves such that consistent steering and speed control is exhibited. It is unclear however, whether driver performance will degrade with prolonged practice, and whether the fidelity of the simulator contributes to this degradation. 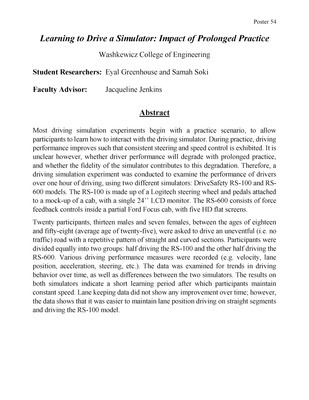 Therefore, a driving simulation experiment was conducted to examine the performance of drivers over one hour of driving, using two different simulators: DriveSafety RS-100 and RS- 600 models. The RS-100 is made up of a Logitech steering wheel and pedals attached to a mock-up of a cab, with a single 24'' LCD monitor. The RS-600 consists of force feedback controls inside a partial Ford Focus cab, with five HD flat screens. Twenty participants, thirteen males and seven females, between the ages of eighteen and fifty-eight (average age of twenty-five), were asked to drive an uneventful (i.e. no traffic) road with a repetitive pattern of straight and curved sections. Participants were divided equally into two groups: half driving the RS-100 and the other half driving the RS-600. Various driving performance measures were recorded (e.g. velocity, lane position, acceleration, steering, etc.). The data was examined for trends in driving behavior over time, as well as differences between the two simulators. The results on both simulators indicate a short learning period after which participants maintain constant speed. Lane keeping data did not show any improvement over time; however, the data shows that it was easier to maintain lane position driving on straight segments and driving the RS-100 model. 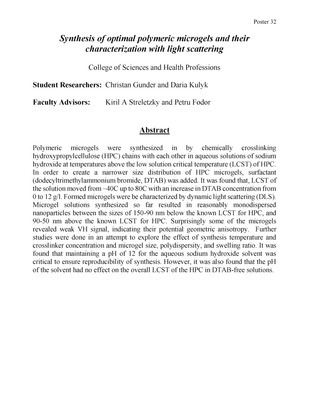 Polymeric microgels were synthesized in by chemically crosslinking hydroxypropylcellulose (HPC) chains with each other in aqueous solutions of sodium hydroxide at temperatures above the low solution critical temperature (LCST) of HPC. In order to create a narrower size distribution of HPC microgels, surfactant (dodecyltrimethylammonium bromide, DTAB) was added. 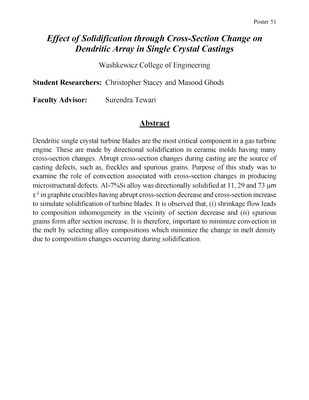 It was found that, LCST of the solution moved from ~40C up to 80C with an increase in DTAB concentration from 0 to 12 g/l. 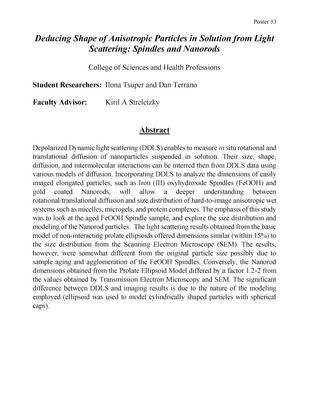 Formed microgels were be characterized by dynamic light scattering (DLS). 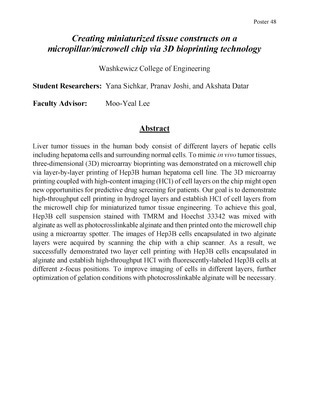 Microgel solutions synthesized so far resulted in reasonably monodispersed nanoparticles between the sizes of 150-90 nm below the known LCST for HPC, and 90-50 nm above the known LCST for HPC. Surprisingly some of the microgels revealed weak VH signal, indicating their potential geometric anisotropy. 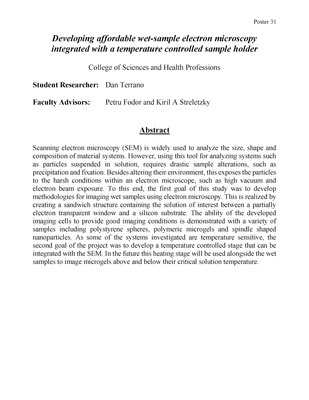 Further studies were done in an attempt to explore the effect of synthesis temperature and crosslinker concentration and microgel size, polydispersity, and swelling ratio. 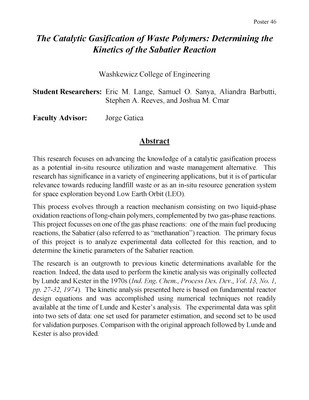 It was found that maintaining a pH of 12 for the aqueous sodium hydroxide solvent was critical to ensure reproducibility of synthesis. 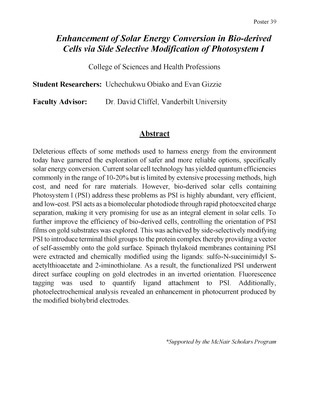 However, it was also found that the pH of the solvent had no effect on the overall LCST of the HPC in DTAB-free solutions. Smartphones have become the central communication and computing devices in our daily life because of their nearly ubiquitous Internet access through various communication capabilities such as WiFi, 3G, or even 4G networks, their user-friendly interfaces supporting touch and gesture based input, and their numerous applications and games. 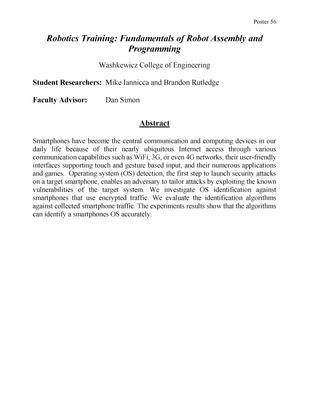 Operating system (OS) detection, the first step to launch security attacks on a target smartphone, enables an adversary to tailor attacks by exploiting the known vulnerabilities of the target system. We investigate OS identification against smartphones that use encrypted traffic. We evaluate the identification algorithms against collected smartphone traffic. 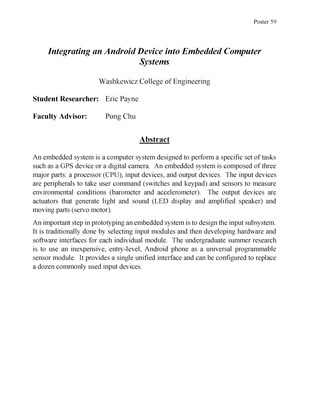 The experiments results show that the algorithms can identify a smartphones OS accurately. Foams, which are mixtures of gas and either a liquid or solid, are important to many applications, from consumer products to industrial processes. Stabilizing the liquid/gas interface against coalescence is key to the performance of foams. 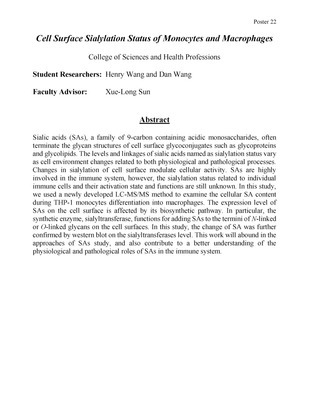 Typically, molecular surfactants (surface active agents) are used for interfacial stability, but adsorption/desorption of surfactant can diminish foam performance. 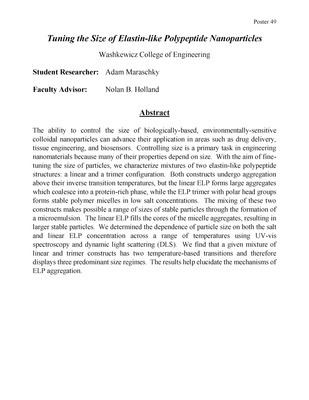 We investigated the use of solid nanoparticles, rather than surfactants, as stabilizers. Fumed silica nanoparticles of varying surface chemistry, ranging from hydrophobic to hydrophilic, were suspended at 1% (w/w) and agitated in solutions of water and ethanol. Foam (gas in liquid), suspensions, and inverse foam (“liquid marbles”) structures formed during agitation; these materials were classified into a structure map as a function of processing conditions. 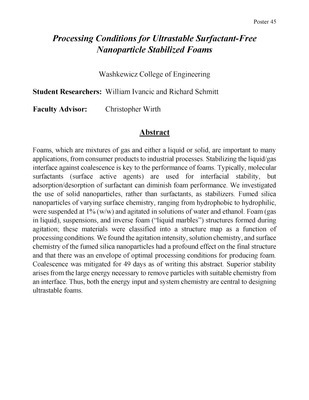 We found the agitation intensity, solution chemistry, and surface chemistry of the fumed silica nanoparticles had a profound effect on the final structure and that there was an envelope of optimal processing conditions for producing foam. 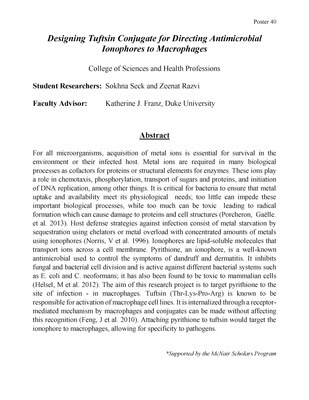 Coalescence was mitigated for 49 days as of writing this abstract. Superior stability arises from the large energy necessary to remove particles with suitable chemistry from an interface. Thus, both the energy input and system chemistry are central to designing ultrastable foams. Particles trapped in a laser experience a linear restoring force that keeps them centered in the trap and will undergo restricted Brownian motion. 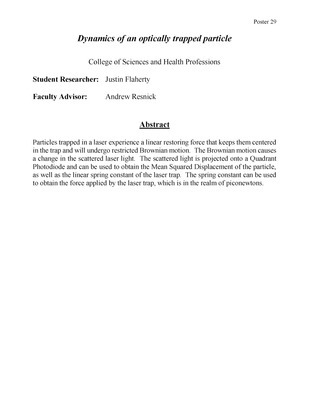 The Brownian motion causes a change in the scattered laser light. The scattered light is projected onto a Quadrant Photodiode and can be used to obtain the Mean Squared Displacement of the particle, as well as the linear spring constant of the laser trap. The spring constant can be used to obtain the force applied by the laser trap, which is in the realm of piconewtons. Clams in the family Sphaeriidae are widespread native mollusk species that are often overlooked. The distribution of these organisms in Lake Erie has not been examined in the 25 years since the initial invasion of the zebra mussel, Dreissena polymorpha. 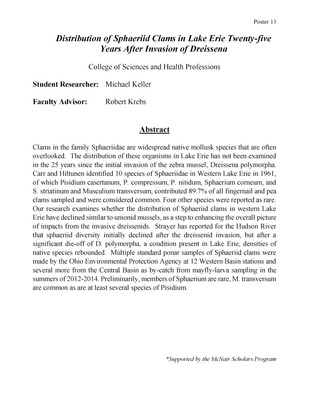 Carr and Hiltunen identified 10 species of Sphaeriidae in Western Lake Erie in 1961, of which Pisidium casertanum, P. compressum, P. nitidum, Sphaerium corneum, and S. striatinum and Musculium transversum, contributed 89.7% of all fingernail and pea clams sampled and were considered common. Four other species were reported as rare. Our research examines whether the distribution of Sphaeriid clams in western Lake Erie have declined similar to unionid mussels, as a step to enhancing the overall picture of impacts from the invasive dreissenids. Strayer has reported for the Hudson River that sphaeriid diversity initially declined after the dreissenid invasion, but after a significant die-off of D. polymorpha, a condition present in Lake Erie, densities of native species rebounded. 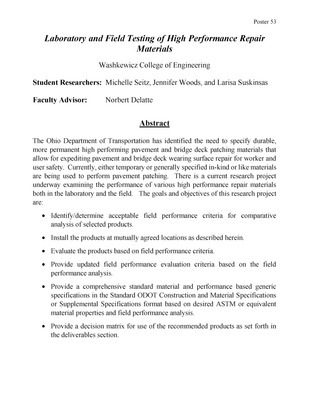 Multiple standard ponar samples of Sphaeriid clams were made by the Ohio Environmental Protection Agency at 12 Western Basin stations and several more from the Central Basin as by-catch from mayfly-larva sampling in the summers of 2012-2014. Preliminarily, members of Sphaerium are rare, M. transversum are common as are at least several species of Pisidium. An accurate assessment of wind speeds at various heights and locations is important in the deployment of wind turbines. 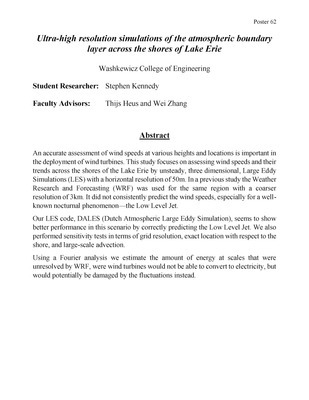 This study focuses on assessing wind speeds and their trends across the shores of the Lake Erie by unsteady, three dimensional, Large Eddy Simulations (LES) with a horizontal resolution of 50m. In a previous study the Weather Research and Forecasting (WRF) was used for the same region with a coarser resolution of 3km. It did not consistently predict the wind speeds, especially for a well- known nocturnal phenomenon—the Low Level Jet. Our LES code, DALES (Dutch Atmospheric Large Eddy Simulation), seems to show better performance in this scenario by correctly predicting the Low Level Jet. We also performed sensitivity tests in terms of grid resolution, exact location with respect to the shore, and large-scale advection. 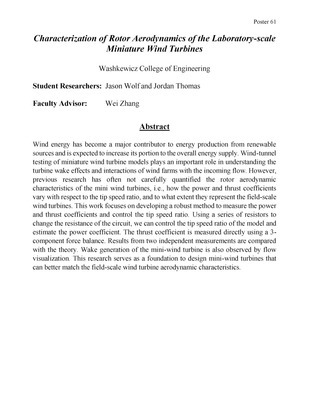 Using a Fourier analysis we estimate the amount of energy at scales that were unresolved by WRF, were wind turbines would not be able to convert to electricity, but would potentially be damaged by the fluctuations instead. Like health care, higher education is one of the relatively few areas where for-profit, public, and nonprofit organizations directly compete with one another. 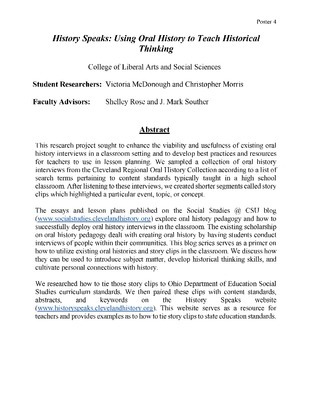 This creates a robust policy debate about the role of for-profits in the delivery of educational services, and provides a window to study widely believed but mostly untested views about differing institutional behaviors in different sectors. Prior literature has found mixed results about student outcomes from for-profit colleges, and existing data on educational quality across sectors have yet to be identified. 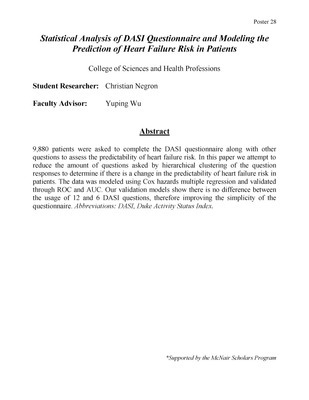 In this study, we coded various information from the written academic dishonesty policies of a large random sample of American universities issuing bachelor's degrees. We hypothesized that the profit motive would tend to push for-profit colleges to prize tuition dollars over policing academic integrity norms, which would push for-profit colleges to adopt policies that impose more lenient punishments for students caught in misbehavior. Our data did not support this hypothesis, as we did not find for-profit college policies to be distinguishable from nonprofit or public college policies in severity of punishment. 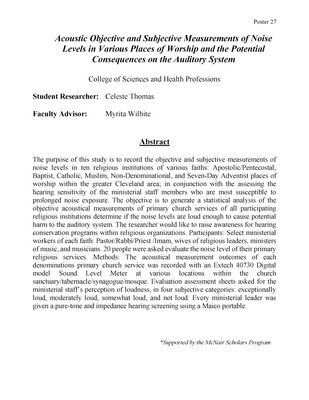 However, religious affiliation was statistically significant with a more lenient maximum penalty, and in some models, the percentage of staff devoted to student support and the graduation rate were associated with stricter minimum penalties. 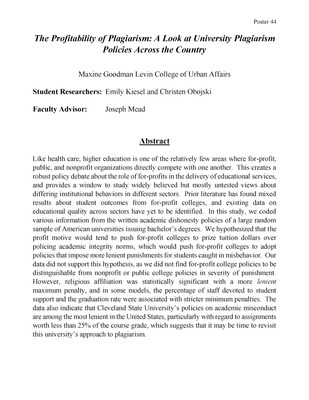 The data also indicate that Cleveland State University's policies on academic misconduct are among the most lenient in the United States, particularly with regard to assignments worth less than 25% of the course grade, which suggests that it may be time to revisit this university's approach to plagiarism. Approximately 10,000 people in the United States are diagnosed annually with a brain tumor. In addition, the prognosis for brain cancer patients is poor as these cancers have low survival rates of less than 10%. 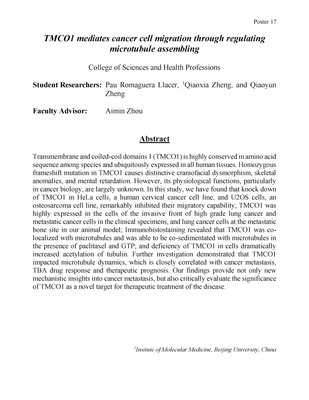 One important chemotherapeutic agent used to treat brain cancer is temozolomide, an alkylating agent that causes cell death by damaging DNA. 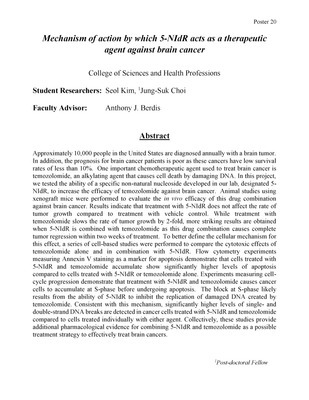 In this project, we tested the ability of a specific non-natural nucleoside developed in our lab, designated 5-NIdR, to increase the efficacy of temozolomide against brain cancer. Animal studies using xenograft mice were performed to evaluate the in vivo efficacy of this drug combination against brain cancer. Results indicate that treatment with 5-NIdR does not affect the rate of tumor growth compared to treatment with vehicle control. While treatment with temozolomide slows the rate of tumor growth by 2-fold, more striking results are obtained when 5-NIdR is combined with temozolomide as this drug combination causes complete tumor regression within two weeks of treatment. 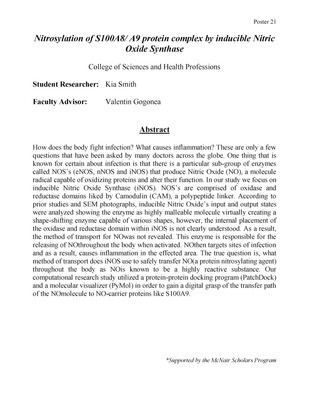 To better define the cellular mechanism for this effect, a series of cell-based studies were performed to compare the cytotoxic effects of temozolomide alone and in combination with 5-NIdR. Flow cytometry experiments measuring Annexin V staining as a marker for apoptosis demonstrate that cells treated with 5-NIdR and temozolomide accumulate show significantly higher levels of apoptosis compared to cells treated with 5-NIdR or temozolomide alone. Experiments measuring cell-cycle progression demonstrate that treatment with 5-NIdR and temozolomide causes cancer cells to accumulate at S-phase before undergoing apoptosis. The block at S-phase likely results from the ability of 5-NIdR to inhibit the replication of damaged DNA created by temozolomide. Consistent with this mechanism, significantly higher levels of single- and double-strand DNA breaks are detected in cancer cells treated with 5-NIdR and temozolomide compared to cells treated individually with either agent. Collectively, these studies provide additional pharmacological evidence for combining 5-NIdR and temozolomide as a possible treatment strategy to effectively treat brain cancers.